Assessing the hopes of the hopeful. It’s nearly the end of North America’s most competitive season yet. Team SoloMid have claimed their crown after a dominant 17-1 run, falling only to Phoenix1. Counter Logic Gaming have fallen to the Immortals, but based on the strength of their Spring performance, they’re heading to Worlds. There’s just one last competitive test for the remaining teams on the table: the gauntlet. The regional qualifiers offer these teams redemption after losing in the playoffs, and the prize is worth the extra time and gruelling series: the last seed available for Worlds. There’s a lot on the line, and only one spot left. Each of the four teams has their own story heading into the gauntlet. This week, let’s take a look at the journey that each team took throughout the season, and what a spot at Worlds would mean for them. Team Liquid have had their share of struggles over the last splits, with ‘forever fourth’ becoming a meme describing their middle-of-the-pack performance. This is, perhaps, the most dire run through the gauntlet for them yet. Their surprise pick of Jynthe wasn’t enough to save them from being knocked out of the playoffs, and now they’ve lost their star jungler, Dardoch. Dardoch had been temporarily benched during the regular split, but returned after their replacement jungler wasn’t able to mesh with the main squad. That’s just a fraction of Liquid’s roster swaps; they also lost World Champion Piglet, putting him on their challenger team... which failed to qualify for the LCS. To say that Liquid is in dire straits would be the understatement of the century, and yet they still have a spot in the gauntlet. Teams have made miracle runs before, but it doesn’t seem likely that Liquid would be able to stand up to the Immortals or Cloud9, who are both looking strong. They may even find themselves unable to defeat the other contender in the first round. If Liquid made it to Worlds, it would be a massive vindication, proof that they had a master plan that paid off. It would just be a plan that pulled the wool over everyone’s eyes, as no one has faith that this squad can even place fourth this time. Team EnVyUs had a strong start to the split, but weren’t able to translate that early potential into real results. The squad has some young talent on it, and it seems to be less an issue of the squad and more a question of infrastructure and coaching. NV has pulled out some really puzzling pick and ban phases, and the players each have problem areas that haven’t been improved, including bursts of over-aggression and mismanagement of abilities. This isn’t to say that the players are bad, or not LCS-calibre. It just means that they would benefit from coaching and analysis, as all players do. This is also EnVyUs’s first split, and it makes sense that they would have a lot of room to improve. They should be proud of their achievements so far, and overtaking two top teams and making it to Worlds would be the cherry on top. It’s not a realistic expectation, but we’ve seen Cinderella stories play out before. In fact, our next team starred in one of them not so long ago. Cloud9 seemed like a team that needed Hai to function. After he returned as a jungler, and then a support, the team pulled out of their nosedive and ran a gauntlet of their own, going from a team that risked relegations to attending Worlds as the third seed. Their new roster of Impact, Meteos, Sneaky, Smoothie, and Jensen have solved the shotcalling issues that plagued them for so long, and they’ve always had mechanically strong carries. Smoothie has proven himself to be a talented young support, and Impact is in rare form, recalling the days in which he was a world champion. While Cloud9 fell to Team SoloMid, their first game was a joy to watch, and even as they lost the next three games, they went down swinging. Doublelift is cheering for Cloud9, and so is anyone who was touched by Jensen’s emotional reaction to losing in the finals he had worked so hard to reach. The Immortals have had an amazing set of regular seasons, going 17-1 and 16-2 during the spring and summer regular splits. You’d have to be a fool to suggest that they aren’t a talented set of players, capable of outplaying North America’s best... except TSM, who they haven’t been able to conquer since the playoffs where TSM took them out in a vicious 3-0 series. The Immortals have been able to take games off every other team in North America, and Team SoloMid aren’t in the equation. However, their record has led people to question whether they’re capable of performing in high pressure, do or die scenarios. 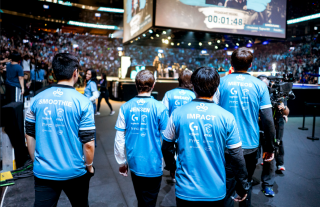 Cloud9 is white hot and hungry for their shot at the world stage, and so are the Immortals... but can the Immortals stand up to the pressure of a Best of 5, knowing that this is their one and only chance to make it to Worlds? If they do make it to Worlds, how will they compete against the international elite? These questions hang over the Immortals, and the gauntlet offers them a chance to start to settle those doubts. The gauntlet allows one more team to join Team SoloMid and Counter Logic Gaming at Worlds. It seems a shame that either the Immortals or Cloud9 won’t be making it, but the points system allows for CLG to compete after their incredible Spring Split, and Team SoloMid have more than earned their place. No matter what, North America should have their most competitive Worlds lineup yet.